Published: Dec. 9, 2018 at 03:15 p.m.
Green Bay Packers running back Aaron Jones rushes for a 29-yard touchdown. Published: Dec. 2, 2018 at 04:12 p.m.
Green Bay Packers running back Aaron Jones rushes for an 8-yard touchdown. 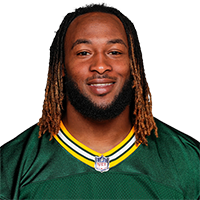 Published: Nov. 25, 2018 at 09:10 p.m.
Green Bay Packers Aaron Jones strolls into the end zone for a 6-yard touchdown. Published: Nov. 15, 2018 at 09:47 p.m.
Green Bay Packers quarterback Aaron Rodgers finds running back Aaron Jones for a 24-yard touchdown.